Title: Buffalo Bill and Wild Bill | Stories of Their Operations in the Early Days of the "Wild West"
BUFFALO BILL AND WILD BILL. Stories of Their Operations in the Early Days of the "Wild West." When Buffalo Bill started upon his stage career—that was in 1873, long before the inception of the Wild West show—he was associated with Texas Jack (Jack Omohundro) and Morlacchi and a lot of Indians in the presentation of the bloodthirsty play in which Wild Bill appeared as the heavy villain. He was a good card. 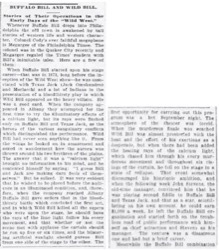 When the company appeared in Albany they attempted for the first time to try the illuminatory effects of a calcium light, but its rays were flashed only on Buffalo Bill and Texas Jack, as the heroes of the various sanguinary conflicts which distinguished the performance. Wild Bill had never seen anything like it. From the wings he looked on in amazement and asked in wonderment how the aurora was thrown around his two brethren of the plains. The answer that it was a "calcium light" brought no information to his mind, and he contented himself by saying: "I guess Bill and Jack are making darn fools of themselves." But he sulked. It was very evident that he wished to be placed before the audience in an illuminated condition, and, therefore, when the company reached Albany Buffalo Bill gave orders that in the bloodthirsty battle which concluded the first act, and in which Wild Bill killed all the supers who were upon the stage, he should have the rays of the lime light follow his every movement, and that whether or not the scene met with applause the curtain should be run up five or six times, and the blistering artificial sunlight should pursue Bill from one side of the stage to the other. The first opportunity for carrying out this program was a hot September night. The atmosphere of the theater was torrid. When the murderous finale was reached Wild Bill was almost prostrated with the heat and the effort of his exertions as a desperado, but when there had been added the heating rays of the calcium light, which chased him through his every murderous movement and throughout six risings of the curtain, he fell on the stage in a state of collapse. 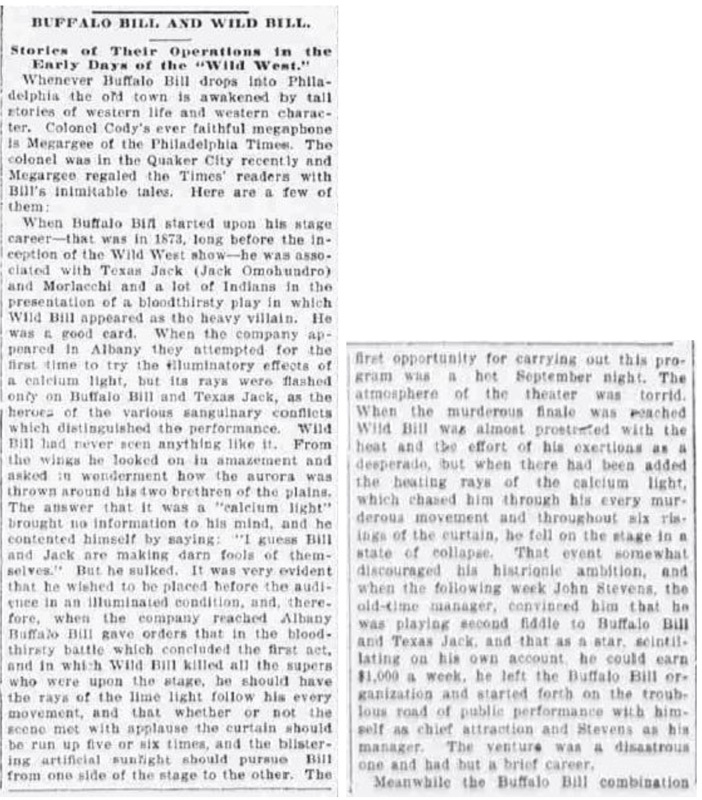 That event somewhat discouraged his histrionic ambition, and when the following week John Stevens, the old-time manager, convinced him that he was playing second fiddle to Buffalo Bill and Texas Jack, and that as a star, scintillating on his own account, he could earn $1,000 a week, he left the Buffalo Bill organization and started forth on the troublous road of public performance with himself as chief attraction and Stevens as his manager. The venture was a disastrous one and had but a brief career. Meanwhile the Buffalo Bill combination felt the loss of Wild Bill; not the loss of his personality, but the deprivation of his sanguinary fame, and, therefore, that the public might be fully satisfied they rigged a mild-mannered man up in the full fierceness of Wild Bill's long-haired aspect. There was no change in the lithographs; none in the glaring posters; none in the public advertisements. Wild Bill appeared on the mimic plains every night and murdered as many victims as of yore. But Wild Bill—now out of a job—heard of this and determined that the public should not be so infamously deceived, and with the good of the people at heart and with the prickings of an empty pocketbook touching his conscience, he determined that this wrong should no longer be continued, and with that object in view he figured on the front row as one of the audience which attended the Buffalo Bill-Texas Jack performance in the town of Binghamton, N. Y. When, in the course of the entertainment, Morlacchi, the pursued maiden, cried out, "Where is Wild Bill?" and the bogus desperado was about appearing from the wings, the only original ruffian arose from the audience, climbed over the musicians in the orchestra, smote his imitator hip and thigh and scattered the assembled sanguinary supers in the wings. He then stepped back, the way he had come, into his seat, and with a calm wave of his hand, exclaimed: "Now let the show go on." A policeman stepped down the theater aisle and tapping Wild Bill on one shoulder said sternly: "I want you." The untutored William looked over his shoulder and said quietly: "How many of you are there?" and when gravely informed that the policeman was alone he calmly said: "Well, you'd better get some others." A reinforcement of one resulted in a similar colloquy, and when in response to the second suggestion three policemen appeared Wild Bill simply said: "You men make me tired. Go way and get some reinforcements." Then down the aisle came the sheriff of the county, and seating himself behind the gentleman from the far west, and placing a hand kindly upon his shoulder, and talking to him gently, brought forth the response: "Now, you're a gentleman. I always give in to a sheriff, 'specially when he's a gentleman. I'll go with you." The next morning he was subjected to a small fine, which was paid by Buffalo Bill. But a few years ago Wild Bill went up against the wrong man, and now he is wild no longer.